The inscription on the billboard reads “There is language, there are Ukrainians, there is a state—there is a future.” Adapted from http:// language-policy.info/2015/11/u-kyjevi-z-yavylasya-sotsialna-reklama-pro-ukrajinsku-movu/. In the current conflict in Ukraine, one of Russia’s most effective propaganda weapons is its ability to fuel the fear in Ukraine’s eastern regions that the new government in Kyiv will enact laws against use of the Russian language and repress speakers of Russian. In 2014, in the aftermath of Euromaidan, the Ukrainian parliament, the Verkhovna Rada, actually passed a law to repeal the “language law” of 2012,1 which had enabled the expansion of Russian at the regional level. Since then, the 2014 repeal has been in limbo, as it has neither been signed nor been vetoed by the president of Ukraine, Petro Poroshenko. Meanwhile, a newly established advisory board has been tasked with strengthening Ukrainian as the state language. The Board for National Unity, which came into existence by a December 2015 decree of President Poroshenko, has the mandate to promote the consolidation of Ukrainian society on the basis of national values and cultural traditions. The board also seeks to craft appropriate measures to reinforce national unity and develop the Ukrainian national identity. With these intertwined linguistic and cultural goals, Ukrainian as the state language should function as the uniting and consolidating power enhancing the state unity of Ukraine. As such, language is held out as a means of unifying people through instilling common values, culture, and thought. Even though people in Ukraine have been multilingual by virtue of using a number of different languages, the language debate in Ukraine has come into sharp focus with the controversy over Ukrainian-Russian bilingualism. The latest arguments about it have invariably been marked by the view that there are specific ways of thinking related to Ukrainian and Russian. Not only does the choice between these languages enable one to identify with Ukrainians or not, it also subjects speakers to the influence of certain political and social “senses,” or persuasions and motivates their preferences for heroes and motherland.6 An even more severe, almost surreal position on the bilingualism issue holds that since Ukrainian and Russian each impose a different worldview, people who speak both languages eventually end up with a kind of split identity amounting to a “linguistic schizophrenia.”7 While Ukrainian promotes national identity, patriotism, and pro-Western foreign policy, Russian introduces the russkiy mir (the Russian world), authoritarian attitudes, and pro-Russian imperial ideals dating back to USSR or even tsarist times. Within such a split-identity framework, language is ascribed a unique power either to unify or to divide Ukrainian people, as the choice of Ukrainian or Russian entails choosing between opposing opinions, identities, and views. Some surveys8 indicate that when language data are cross-tabulated with responses to questions regarding views on the CIS and Western Europe, an association between language and outlook is apparent: up to 43 percent of Ukrainian speakers think their country’s future lies with Western Europe, while only 23 percent think Ukraine’s future is with the CIS. Among Russian speakers, 52 percent prefer the CIS and only 16 percent choose Western Europe. The bilingual category shows a similarly unequal distribution, with 41 percent in favor of the CIS and 28 percent preferring Western Europe. The percentage of those choosing both orientations is almost identical across categories: 34 percent of Ukrainian speakers, 32 percent of Russian speakers, and 31 percent of bilingual respondents. The КМІС created an index measuring the effectiveness of Russian propaganda while isolating factors such as gender, age, education, and region of residence. Of these factors, only the respondent’s region correlated with agreement with the Russian narrative. 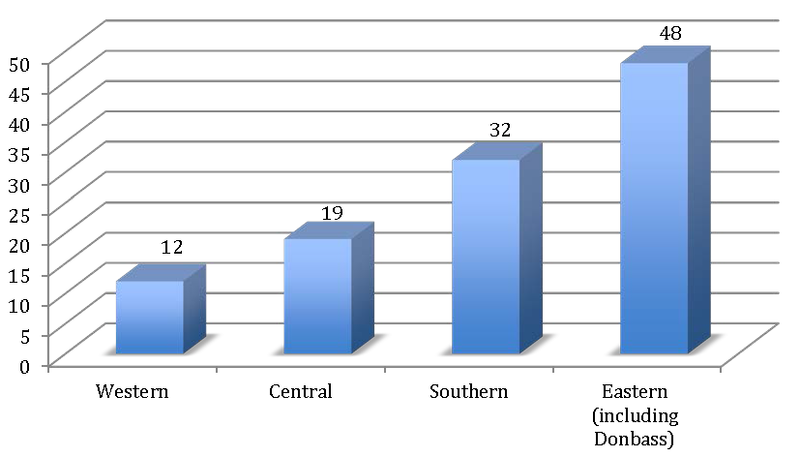 The lowest level of influence of information from Russia occurred in the western (score = 12) and central (score = 19) regions, while it was far higher in the south (score = 32). In the east, the score was four times as high as in the west (score = 48) (figure 2). The respondents’ native language was not directly measured by the question, although the language in which the respondent replied to the survey was captured. Ukrainian speakers were found to be least affected by the Russian propaganda narrative (score = 15), while Russian speakers demonstrated the most agreement (score = 38). Responses that included a mix of Ukrainian and Russian fell almost exactly in the middle (score = 27). While the authors of the survey readily admit that their data on the effectiveness of Russian propaganda are not definitive, the data do generally confirm the common impression that language influences a speaker’s ideals and political orientation. Other important linguistic trends in 2015 included a growing number of people willing to attend free Ukrainian language courses, an increase in the number of those who voluntarily switched over to speaking Ukrainian, the persistent refusal by some to learn Russian in schools, and several other actions constraining the use of the Russian language. For example, a court judgment in Lviv forced the State Migration Service to issue a national passport without duplicating the information in Russian. Another decision required the Ministry of the Interior to translate all speeches by its Russian-speaking minister, Arsen Avakov, into Ukrainian. The Kyiv City Council adopted a regulation promoting the Ukrainian language, culture, and historical memory among the inhabitants of the capital during the years 2015–2020. A new version of the law on the Ukrainian civil service10 that requires the use of the Ukrainian language has motivated more and more state employees to enroll in Ukrainian language courses. Apart from being a national symbol, language is first and foremost a means of communication. We use it to express our ideas, desires, and needs, and to make them accessible to others. We learn foreign languages to be able to communicate with other people and to understand them ourselves. If we dig a bit deeper, we see that language serves to label the world and present it to us in a neat classification that reflects the way we see it. Not only does language show whether we care about different shades of blue, it also captures our habits of behavior and thought, and helps us identify ourselves with a particular community and culture. Language also makes it possible to pick out outsiders just from the way they speak. We often take language for granted, and have no idea of the importance of language to what makes us human. Indispensable as it is, language by itself does not automatically introduce related cultural sensitivity, communal identity, or political orientations, as some of the most “linguistically conscious” activists in Ukraine imagine it does. Moreover, language—any language—has almost nothing to do with how we conceive of such identity issues. Large-scale sociological surveys in Ukraine11 have shown that the strongest driver of divides in political matters between eastern and western Ukrainians is not language or even ethnic identity. Rather, regional effects were found to have the strongest impact on foreign policy preferences, and regional origin is obviously independent of identity or linguistic habits. Neil Munro, a senior research fellow at the Center for the Study of Public Policy, the University of Aberdeen, Scotland, interprets the regional effects as indicative of historical ties that bind each of the macro-regions to neighboring states in a way that is not characteristic of the country as a whole.12 Therefore, identity and language are not the major influences; at least as far as foreign policy preferences are concerned. 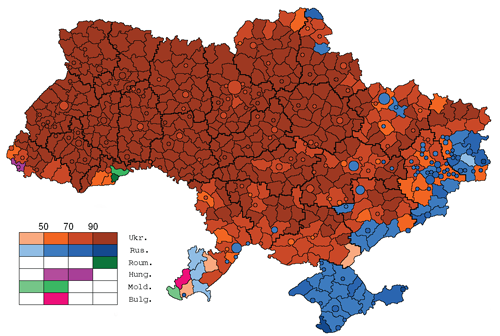 The historical explanation reveals that the correlation between language and political worldview is by no means a cause-and-effect relationship; instead, both language and attitudes are the consequences of the earlier histories of Ukraine’s different regions within the boundaries of other states. In addition to sociological studies, voluminous psycholinguistic research has recently been conducted worldwide on the very problem of the influence of language on thought, termed the Sapir-Whorf hypothesis.13 Having shown a significant impact of language in the experiential domains that we all operate in, such as space, time, motion, cause, and color, experimental studies suggest that “we can only talk and understand one another in terms of a particular language.”14 While language certainly expresses unique cultural concepts, its distinctive influence has so far been evinced only in the fields referring to the physical environment we all share. While these models require extensive psycholinguistic and anthropological research, real-world situations suggest that the overall framework is worth considering. It explains why language is so important in Ukraine and how identity and worldview come to be related. First and foremost, there is dialogue at stake. Arranging dialogue has always been problematic in Ukrainian society. We are a very tolerant society, but we cannot organize a productive dialogue leading to a commonly accepted resolution of the problem, and unity. Russian-speaking Ukrainians are excluded from the dialogue and thus are being converted into enemies by our own demonizing reaction toward everything with a Russian scent. Research carried out in Sloviansk has shown that spreading counterpropaganda there in Ukrainian had a counterproductive effect: the counterpropaganda messages could not even reach those Russian-speaking people still loyal to Ukraine. Language was the barrier. Undecided Russian speakers started to believe Russian and Russian-language agitprop when they were told anything in Ukrainian. If we are talking about arranging a dialogue with temporarily lost communities, this dialogue must certainly be conducted in the Russian language. While linguistic science tells us that a language can emotionally unite those who speak it and inculcate in them a shared, common view of the physical world, experimental research also emphasizes that it is possible to understand others in their own language. In other words, if you want to reach other people, you should speak to them in their own language. The government of Ukraine has proclaimed 2016 the Year of the English Language in Ukraine. President Poroshenko made the decision out of consideration of “the role of the English language as a language of international communication and [an interest in] promoting its learning to increase access to the world’s economic, social, educational, and cultural opportunities for the citizens of Ukraine.”17 The measure is also intended to bolster Ukraine’s integration into the European political, economic, and academic space, as well as to support the Go Global program, which identifies mastering English as one of the priorities of the country’s development strategy. While no one doubts that multilingualism is required to integrate into Europe, the necessity of multilingualism for Ukraine’s internal integration is becoming increasingly evident. Whether it will bring a change in how Ukrainians think will become clear over time. What is obvious now is that the monolingual policy of previous years is no longer relevant today. Whether we want unity, integration, or dialogue, we still need to learn to communicate with the world and with each other, and this holds true no matter what language we speak. 1 The Law of Ukraine “On the Principles of the State Language Policy,” also known as the Kolesnichenko-Kivalov law, was passed in 2012 despite numerous constitutional violations and drew huge protests from the general public. The law established the Ukrainian language as the language of the state, but it also substantially increased the use of regional languages so long as their speakers constituted 10 percent or more of the population of a region. The “language law” has largely been considered to be a means of allowing Russian to function on a par with Ukrainian, or even to substitute for it, in state administration, local government, education, mass media, legal proceedings, and other spheres of public life. 2 Ukrainian Census, “Results,” 2001. Available at http://2001. ukrcensus.gov.ua/results/general/language/. 3 The figure is adapted from the Wikipedia Commons file “Nativelanguage2001ua,”by Tovel (own work), December 14, 2012.Licensed by CC BY-SA 3.0 through https:// commons.wikimedia.org/wiki/File:Nativelanguage2001ua. PNG#/media/File:Nativelanguage2001ua.PNG. 4 Опитування: більшість українців спілкуються вдома українською мовою[Survey: Most Ukrainians speak Ukrainian at home], 2011. Available at http://tsn.ua/ ukrayina/opituvannya-bilshist-ukrayinciv-spilkuyutsyavdoma-ukrayinskoyu-movoyu.html. 6 Sergii Osnach, “Як мова визначає наших героїв і вітчизну” [How language defines our heroes and motherland], 2015. Available at http://language-policy.info/2015/12/yak-movavyznachaje-nashyh-herojiv-i-vitchyznu/. 7 E. Knygarnia, “Лекція Юрія Шевчука на тему ‘Політика мовної шизофренії в Україні. Джерела, форми, наслідки’” [Yuri Shevchuk’s lecture on the theme of “Policy of language schizophrenia in Ukraine: Sources, types, consequences”], 2015. Available from http://book-ye.com.ua. 8 see Munro, Neil. 2007. Which way does Ukraine face? Popular orientations towards Russia and Western Europe. Problems of Post-Communism, vol. 54, no. 6. – p. 49. 10 The Law of Ukraine “On Civil Service” is a step in the process of reforming the Ukrainian civil service system. The new version of the law, passed in December 2015, is intended to increase the personal responsibility of civil servants. The law also obliges them to use the state language, Ukrainian, while engaged in civil service functions. 13 B. L. Whorf, “The relation of habitual thought and behavior to language,” 1941. Available at http://web.stanford.edu/ dept/SUL/library/extra4/sloan/mousesite/Secondary/ Whorfframe2.html. 14 D. Slobin, “From ‘thought and language’ to ‘thinking for speaking,’” 1996. Available at http://ihd.berkeley.edu/SlobinLanguagepercent20&percent20Cognition/perce... ercent29percent20Slobinpercent20-percent20Frompercent 20thoughtpercent20andpercent20languagepercent20toper cent20thinkingpercent20forpercent20speaking.pdf. 15 L. Perlovsky, “Language and emotions: Emotional SapirWhorf hypothesis,” 2009. Neural Networks 22(5–6): 518– 526. doi:10.1016/j.neunet.2009.06.034. 16 K. Matsiupa, “Михаил Минаков: Мы должны думать о людях, а не о территории,”Крым.Реалии[Mikhail Minakov: We should think about people, not territory. Crimea: The Actual Situation], June 8, 2015.Available at http://ru.krymr.com/ content/article/27060554.html. 17 President of Ukraine’s official website, “President declared 2016 the year of English language,” 2015. Available at http:// www.president.gov.ua/en/news/prezident-ogolosiv-2016- rik-rokom-anglijskoyi-movi-36317.